We’re excited to announce that our first confirmed speaker is US disability rights lawyer Lainey Feingold. 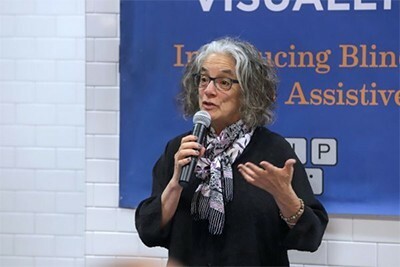 Lainey Feingold has worked in disability rights since 1992, and opened her own law office in 1996, from where she represents disabled people seeking full participation in all society has to offer. Her principal work is with the blind and visually impaired community on technology and information access issues, including web and mobile accessibility. Along with like-minded colleagues, Lainey developed Structured Negotiation, an alternative to filing a lawsuit that emphasises collaboration and focuses on solutions, and in 2016 the American Bar Association published her book, Structured Negotiation, A Winning Alternative to Lawsuits.